U.S. Navy fleet has reached condition maintenance because the money is not budgeted. Yards may however, find some relief at the end of this month, dependent upon whether Congress passes a supple- mental bill for additional funding. Already five months into the govern- ment's fiscal year and ship repair yards have not seen a cent of additional fund- ing from the Navy for the maintenance and repair of its fleet. With surface ships suffering the most from this shortfall, ships are rusting away and not receiving the attention that they need, which could one day lead to a serious fleet decline. Commanders will be faced with vessels that spark a serious question directly involving the fate of the U.S. Navy and its fleet: "Will they be able to handle potential conflicts?" Repair, and president of Norfolk Ship- building and Drydock, the budget for naval funding, especially for surface ships, has fallen short during the past few years. Currently the overall fiscal year 2000 budget designated for Navy Ship Repair & Maintenance stands at $2.4 billion, most of which is targeted for nuclear powered ships. In response, a request for additional funding via a supplemen- tal bill is currently pending in Congress. Known as the Emergency Supplemental for Fiscal Year 2000 Focused on Mili- tary Readiness, the bill stipulates (per a suggested analysis by U.S.M.R.) that a total of $235 million should be rendered to the yards on both U.S. Coasts — $145 million on the Atlantic and $90 million on the Pacific. Lack of funding has been a hallmark of the Navy repair and maintenance scene for more than a decade, falling 50 percent since 1990. The result: mainte- nance backlogs at navy bases and facili- ties. Estimated at $2.5 billion, these backlogs are expected to climb to $4 bil- lion over the next few years. Senate Armed Services Committee dis- pensed a warning per the declining state of military readiness, which obviously has not made its mark with the Navy — despite dangerous conditions that con- tinue to remain on these vessels. 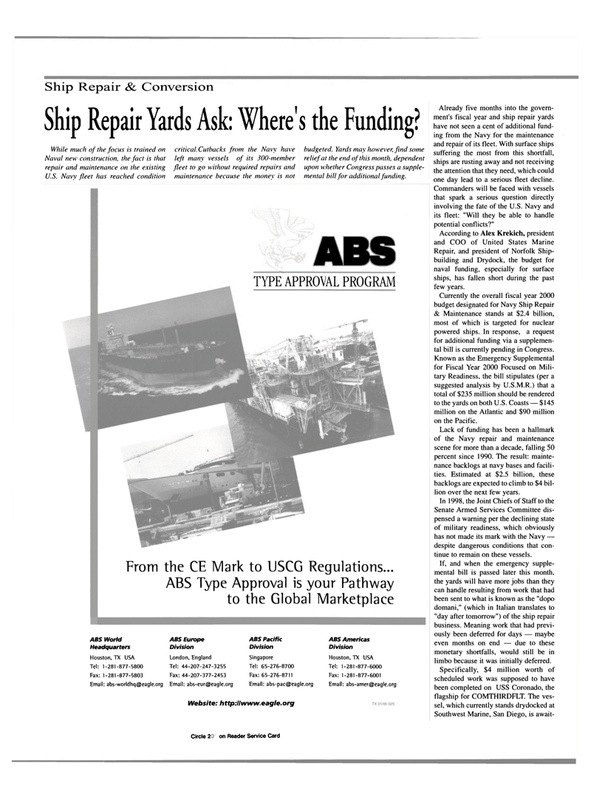 If, and when the emergency supple- mental bill is passed later this month, the yards will have more jobs than they can handle resulting from work that had been sent to what is known as the "dopo domani," (which in Italian translates to "day after tomorrow") of the ship repair business. Meaning work that had previ- ously been deferred for days — maybe even months on end — due to these monetary shortfalls, would still be in limbo because it was initially deferred.